In the spring of 2017, the Colorado State Patrol led a multi-month, multi-agency effort to improve the safety of all highway first responders in the state. The Governor's Task Force on First Responder Safety examined how highway first responders are trained and how they operate in order to identify opportunities to make their jobs safer and, ultimately, reduce injuries and deaths. Task Force has published its findings in a report. 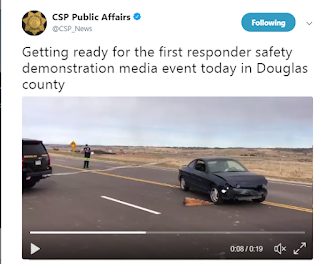 The State should establish and fund a permanent, multi-disciplinary standing committee on first responder safety, led by CSP, responsible for achieving a "one-scene culture" by executing unified and comprehensive updates to training, operations, policies and procedures, communications, and infrastructure, including technological advances. To improve first responder safety, all responders and the traveling public must take steps to eliminate, reduce, and minimize exposure to active traffic. These two overarching recommendations are supported and extended by numerous other recommendations all categorized into five primary focus areas: Training and Operations, Infrastructure, Technology, Communication, and Policy and Procedure. One of the foundational goals is to create a one-scene, one culture approach to traffic incidents on our roads. The one-scene one culture approach advocates that regardless of the multiple disciplines on scene of traffic incidents all first responders have the same goal-Safety. The Colorado State Patrol, in collaboration with public safety partners, will lead the effort to implement the recommendations contained in the report. during a kick-off event on Nov. 17, 2017. 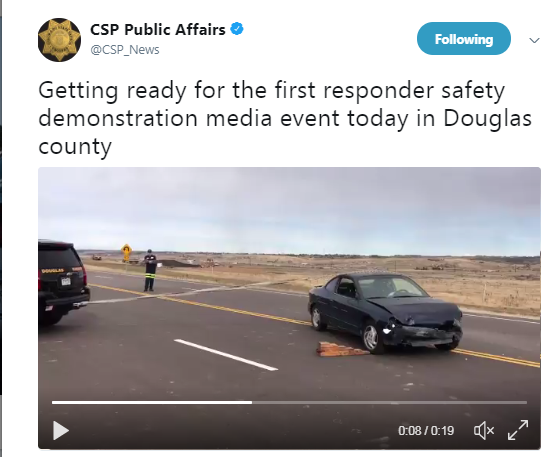 On Nov. 17, the State Patrol kicked off the effort during a joint event held in partnership with the Colorado Department of Transportation and the Douglas County Sheriff’s Office at their new Liniger Emergency Vehicle Operations Center in northwest Douglas County. The event was held during National Traffic Incidents Responder Week, and the Denver Regional Council Of Governments (DRCOG) participated by requesting that member city and county councils declare the week as "First Responder Safety Week." Additionally, in January 2018, a state-wide, multi-disciplinary standing committee dedicated to highway first responder safety will be established. The standing committee’s goal will be to facilitate the state-wide consideration and implementation of the recommendations contained in the report.